Why are boar bristles so good for your hair? 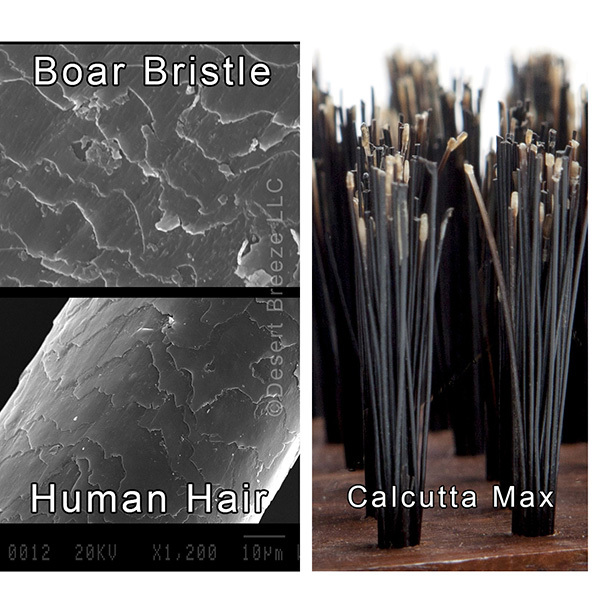 Boar bristles are good for hair because they are similar to each other in structure. Like human hair, boar bristles are made of keratin. As seen in the microscopic photo at left, the scales of a boar bristle closely resemble those of a human hair. These scales absorb the natural oils produced by the scalp, and distribute it gently down the hair shaft. 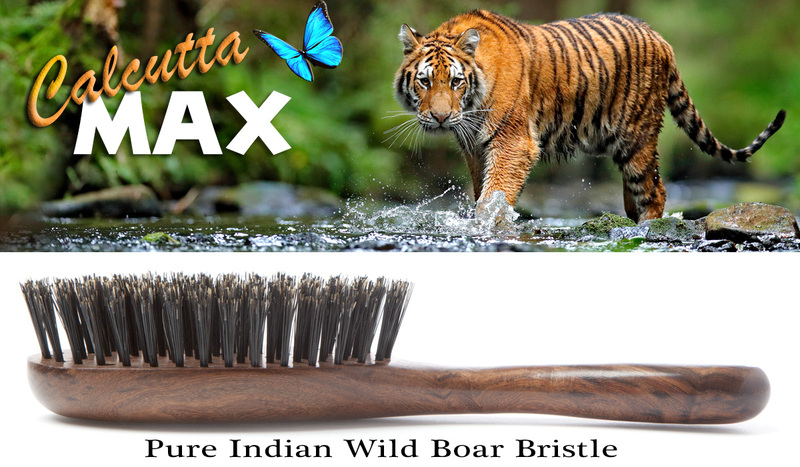 Synthetic bristles cannot provide the same benefits of a quality boar bristle brush. Over time, regular brushing with a boar bristle brush will have a powerful effect on the overall health of your scalp and hair, and will improve the texture and vibrancy from roots to hair ends. To create a brush that will penetrate through thick or long hair without the aid of synthetic bristles, we source the thickest, highest quality bristles in the world, then have them cut to a length that is longer than industry standards. The precision spacing between tufts also allow the brush to better penetrate through thicker hair types, and to grip long hair to the ends for a more thorough, natural brushing experience. A brush that flows through long or thick hair without synthetic bristles - because everyone should enjoy a pure boar bristle hair brush! High quality wild boar bristles naturally absorb oils from the scalp. 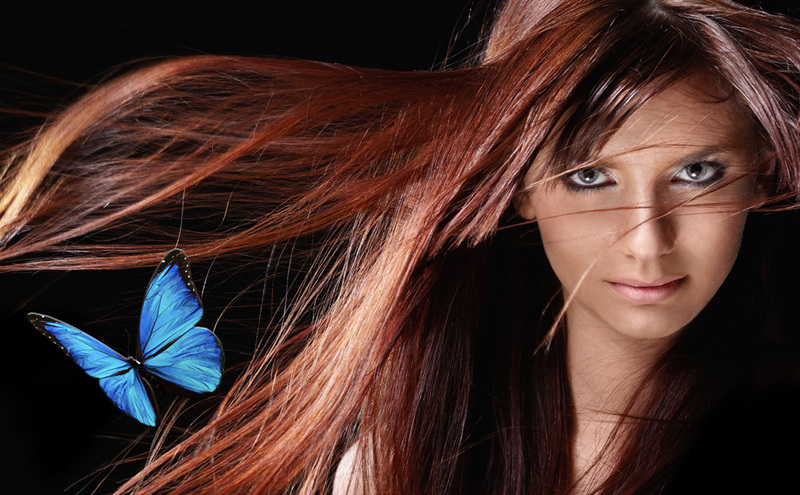 When the hair is brushed, this oil is transferred down the hair shaft. This process creates a natural sheen, volume and fullness, while also helping to prevent split ends. BRUSH SIZE: 9" x 3" X 1.5"
Your Calcutta MAX brush is built to last a long, long time. Keep the brush free of loose hair by using a fine tooth comb or brush cleaner for optimum performance (we recommend the Desert Breeze Brush and Comb Cleaner - search Amazon for: B079F9ZT49). It is good to occasionally wash the bristles with water and shampoo. Do not leave the brush to soak. Dry the handle with a soft cloth, then set the brush with bristles pointing downward away from direct heat to finish drying. Boar bristles vary between species of Wild Boar, age of the animal, and the climates they are raised in. 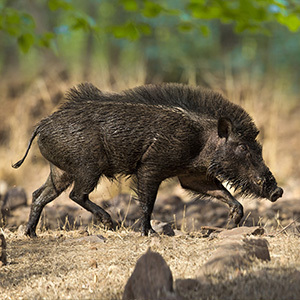 In the moist, high elevations of India, the Indian Wild Boar grows especially thick bristles. They are raised on small family farms where they live their lives in the open air. The boars thrive in the high temperatures and moist climate, and grow especially firm bristles. The boars are raised for their meat, but the bristles are saved for the merchant who travels throughout the highlands to purchase them. 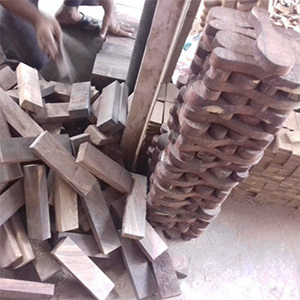 The handles are made from premium Indian Rosewood in their native India. Hand finished to perfection, they are then shipped to the USA where the bristles holes are precision drilled and securely tufted. The attention to fine details by highly skilled craftsmen from the original sourcing of the very best materials to the beautifully finished product is evident in every brush. The finish of the Calcutta MAX handle is completely natural. Indian Rosewood is high in oil, so when the handle is hand rubbed in its native India by skilled craftsmen using nothing more than a special cloth, a natural sheen is created. No additional wax, lacquer, chemicals, or oils have been used. The practice of hand rubbing wood for a natural finish is an old skill that is rarely done in this day of mass produced products. It takes a lot of time and effort to finish a handle this way, yet it adds to the value, durability, and beauty of this fine brush. I have natural curly medium density thick hair, and this brush stimulates my scalp, doesn't damage my hair, no hair in the brush. I have been looking FOREVER for a brush that wouldn't damage my hair and stimulate my scalp and this is the brush. I also purchased the wooden comb and the Natural Boar Bristle and Rounded Wood Pin Combination Hair Brush, if you want beautiful healthy hair, these brushes are amazing and beautiful. Perfect for natural curly coily hair. 100% worth the price!!! I have medium-thick naturally red, curly, and frizzy hair. I been trying to take care of my hair naturally and I heard that a boar bristle brush would help. I was a little unsure about the price of this brush, but it has been worth every penny. I have had this brush for a week and have been brushing my hair 2-3 times a day. I already see the difference in my hair. It is a really nice quality brush. I actually loved this brush so much, I bought their PWC combination brush, which is divine! Love their products, I’m hooked! This is a great brush! Not to stiff but stiff enough. I love it! Very good quality too!